The invitation to Spain appeared very unexpectedly. However, from the beginning, we were convinced that it is part of the wider missionary plans of the Congregation. In June 2017, Mother Jana Zawieja attended a meeting at the Pontifical Council for the Family in Rome. There her path crossed with a priest from the Spanish Diocese of Segorbe - Castellon, Fr. Luis Oliver, the priest responsible for the pastoral care of families in this diocese. For a long time, Father Luis had been looking for a religious congregation which would undertake initiatives for the pastoral care of families in the diocese. Upon his departure for a meeting in Rome, Fr. Luis asked for the intercession of Saint John Paul II in this intention. Is it possible to consider this a chance encounter? Rather not ... In her conversation with Father, M. Jana shared about the Congregation, its charism and mission. She presented various forms of work with families, including the Association of the Holy Family. Father Luis talked about the dreams of the Diocese, and about the plans of Bishop Casimiro Lopez Llorente. Already in December of that same year the Bishop sent to Rome an official delegation from the diocese: the vicar general, Fr. Yago Gallo together with Fr. Luis Oliver. This next stage of discussions was much more detailed. During meeting in Rome. 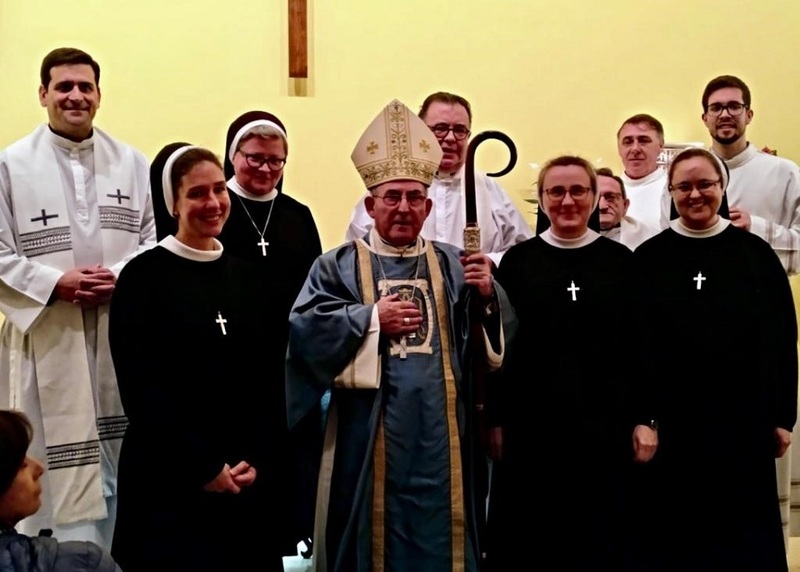 From the left: Sr. Halina Dołęga, Fr. Luis Oliver, S. Helen Tereba, M. Jana Zawieja and Fr. Yago Gallo. 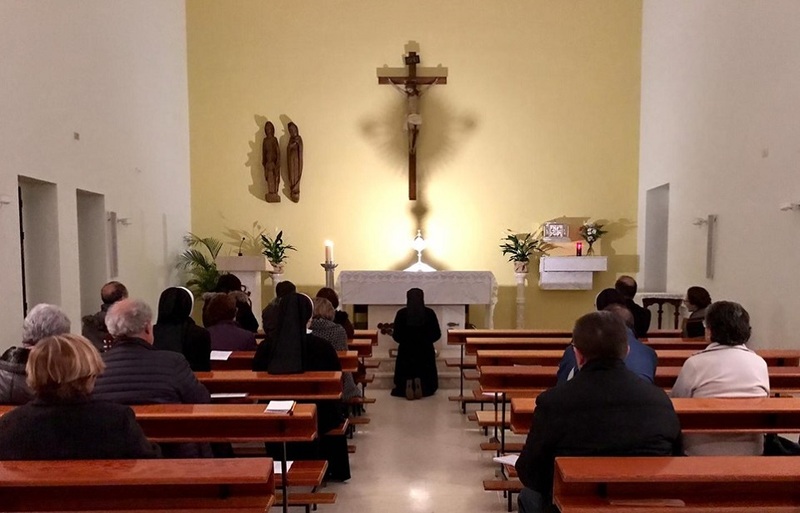 In January 2018, at the invitation of the Bishop, Mother Jana went together with Sister Angela Marie Mazzeo to visit Spain. This was a fruitful time. 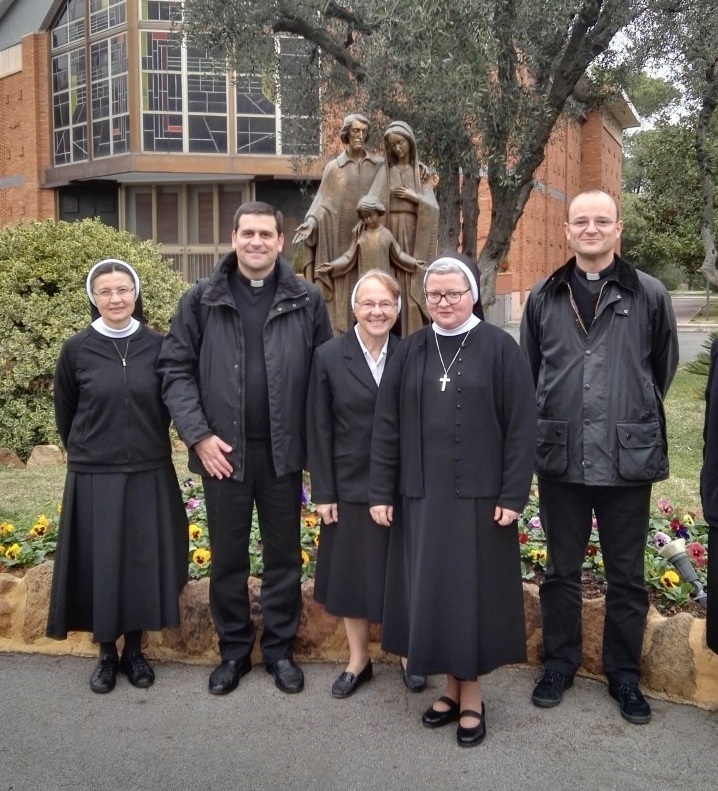 The parishioners in Benicassim welcomed the Sisters very warmly. The Sisters saw the house where the community would live, and which could become a center for the pastoral care of the family. There was also a meeting with Bishop Casimiro Lopez. During meeting in the Diocese of Segorbe – Castellon. From left: Fr. Yago Gallo, Bishop Casimiro Lopez Llorente, M. Jana Zawieja and Sr. Angela Marie Mazzeo. After returning to Rome, Mother Jana and Sister Angela Marie presented their observations and opinions to the whole general council. The council decided that the final decision regarding our response to the bishop in Spain would depend on the result of the visit to Cuba planned for January 2018. Cuba had requested our Sisters first. Would we be able to reconcile these two requests? 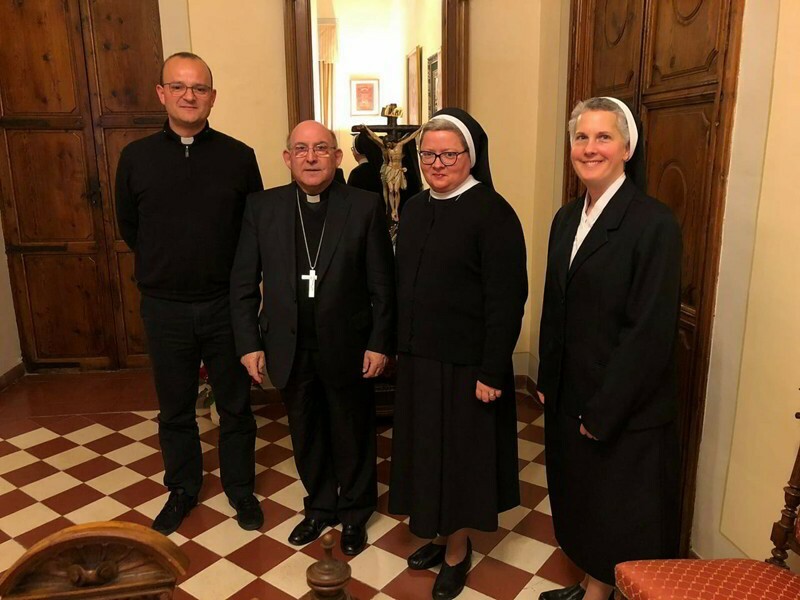 As it soon turned out, the visit to Cuba by Mother Jana Zawieja and Sister Daniela Tupaj strengthened us in the conviction that Spain could become a very good "entry way" for the mission in Cuba. What's more, it could become a place of apostolic and language learning for future missionaries. And above all, it could be a spiritual base for a distant Cuban mission. Thus, the General Administration decided to give a positive answer to Bishop Casimiro Lopez Llorente from the Diocese of Segorbe - Castellon. Already in April 2018, the next visit to Spain took place. This time Mother Jana Zawieja went, accompanied by Sister Daniela Tupaj. At that time, details of the contract were agreed upon, and necessary repairs were planned in the house so that the Sisters could live there and begin their apostolate. The opening of the facility was planned for Autumn 2018. The Sister’s residence and place of ministry. 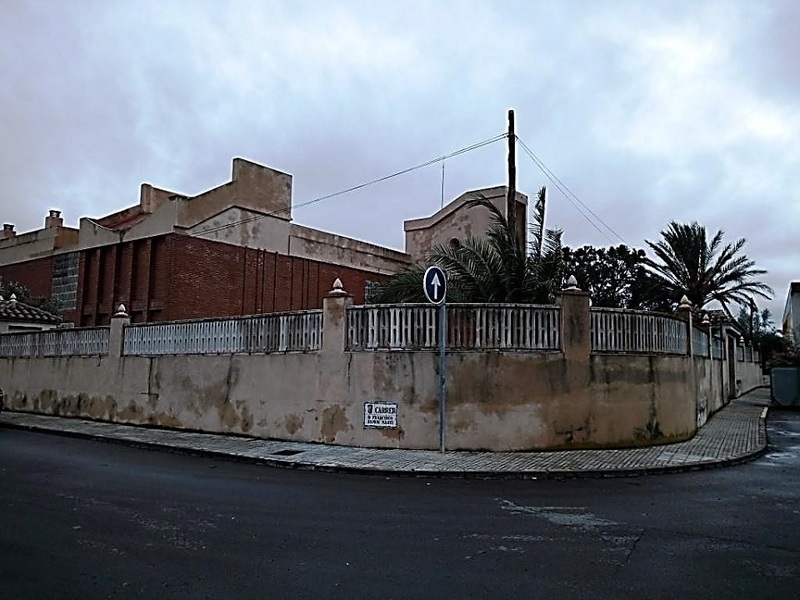 The official inauguration of the House of the Holy Family in Benicassim took place on October 1, 2018. After the Mass which was celebrated in the parish church, an agreement was signed between the Congregation and the Diocese. The act of signing the contract was carried out by Mother Jana Zawieja and Bishop Casimiro Lopez Llorente. 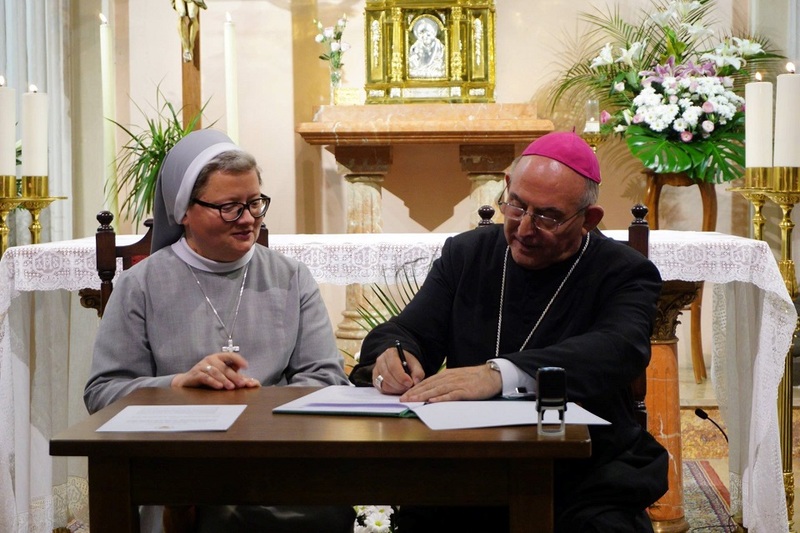 M. Jana Zawieja and Bishop Casimiro Lopez Llorente signing the agreement. On December 12, the chapel was opened in the Sisters’ home, which became a special place of prayer with families and for families. The Sisters are also involved in various forms of pastoral activity in the parish, such as Caritas or catechesis. They continue to learn the language and to learn more about the realities of the local Church. Day after day, Jesus seems to reveal more and more His plans for us in Spain. We try to listen, read the signs, and prepare for a broader service to families. Apostolate of prayer with and for families. From the left: Sr. Michalina Pawlak, Sr. Katarzyna Nowak, Sr. Karolina Szpak in the convent garden.